Two cultures collide during the early 1900’s Mexican Revolution in El Paso, Texas. Edward, a Federal Agent, prevents an assassination attempt of two visiting presidents; Francisco I. Madero and Porfirio Díaz. Shortly after, and fearing for his life, Edward is smuggled to Mexico and recovers in the house of a prestigious Mexican home. There he meets a beautiful young woman name Moira. Under extremely difficult circumstances, they fall in love and are remarkably keep in contact even though they are separated by many hundreds of miles. This is the first-of-its kind film project. It will be produced and distributed in multiple ways. – As a 2D regular film. – As a Holographic and Live live experience. The idea of the Holographic version is to screen it inside a movie theater. The first five minutes of the film will be displayed like a regular film with a screen and projector in front of an audience and a surround sound speaker system. 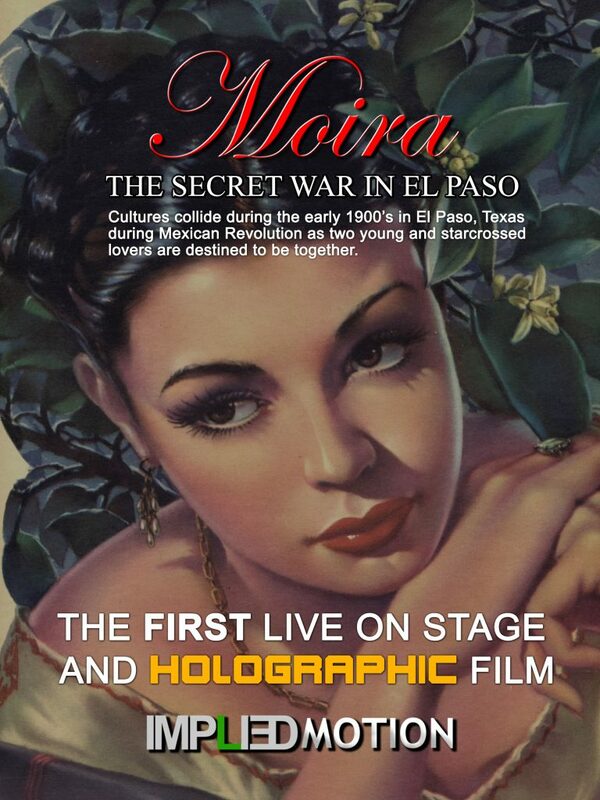 In the middle of the film, there will be introduced holographic elements over the projected film. At the end of the film the audience will be surprised by two real actors from the film acting out the last scene in front of the audience. The last scene will also include four musicians at the four corners of the room providing the audience with a true 360 live audio experience. Logline: In early 1900s during the Mexican Revolution in El Paso, Texas, two young lovers from two opposite Worlds are destined to be together. One is an American Federal Agent, the other a young Mexican woman from a very wealthy and prestigious family.